Bluetooth® Smart The special Bluetooth® technology for saving energy ensures the exchange of data at low power consumption with a simple click on the appropriate button. Using Bluetooth® you can connect the watch to your smartphone, by accessing a series of useful functions that you want. Super lighting by Pressing a button the dial is illuminated in a fashionable color. Shock-resistant construction anti-shock, protects from shock and vibration. Stopwatch - 1/100 sec - 24 hours Detection of the elapsed time. The fraction indicates the unit of measurement while the number indicates the maximum time measurement. Lap Memory 200 memory 200 laps And you can store the pause time, revolutions and the partial with the date and view them later. Each entry consists of: date, time stop, lap and intermediate. The memory can store up to 200 records. Shift function of the hands With the push of a button, the hands move allowing complete visibility of functions like stopwatch or date. 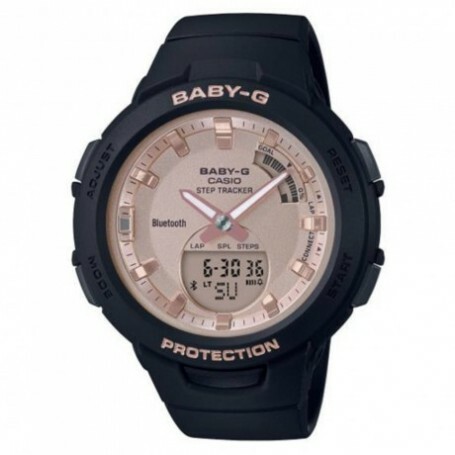 Mineral glass The mineral glass, robust and, most scratch-resistant, protects the watch against unsightly damage. 2 years - 1 battery The battery supplies the watch for approx. 2 years.